BountyJobs' vast marketplace paired with HiringThing adds a high level of value to our customers and makes finding the perfect hires happier and easier. 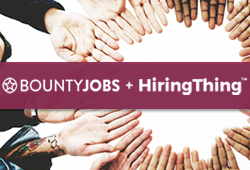 BountyJobs, Inc., leading provider of third-party recruiting platform for collaboration between employers and search firms with over $1.6 billion in placement fees to recruiters and the world’s largest recruiter marketplace, today announced a strategic partnership with applicant tracking provider, HiringThing. This strategic relationship with HiringThing is the latest in the fast-growing BountyJobs partner network, seeing 500% growth in 2018 and resulting in the largest partner network of any recruitment marketplace. This network connects innovative technology providers focused on improving the way companies recruit, attract and retain talent. This mix of partners has been hand-selected to help support the key constituents of the 2-sided BountyJobs Marketplace; employers and recruiting agencies. The BountyJobs solution can be integrated within any ATS and values the relationships and expertise that partner agencies bring to the table. HiringThing's ATS streamlines every aspect of the recruiting process, including ad placement and syndication, candidate communication, interview scheduling, onboarding, and sourcing. Through their customized recruiting workflow, network of leading job boards, and fully integrated recruiting toolkit, it allows companies to attract and engage best-fit candidates with a superior candidate experience. The company focuses on delivering Hiring Happiness™ to each customer, simplifying the process of finding the perfect hire. "We look forward to providing a suitable option to our customers who are seeking quality candidates for their open positions," said Joshua Siler, CEO of HiringThing. "BountyJobs' vast marketplace paired with HiringThing adds a high level of value to our customers and makes finding the perfect hires happier and easier." HiringThing, founded in 2012, is award-winning recruiting software that helps simplify and shorten the hiring lifecycle by automating processes, facilitating collaboration, and organizing data. Our team includes experts in interface design and top-notch developers who write clean, powerful code. Our goal is to manage the complexity of the process on the backend so that our customers can focus on what matters most — finding the perfect hires. For more information, call 888.769.2023, email info@hiringthing.com, or visit http://www.hiringthing.com. HiringThing's ATS Anywhere platform is designed to provide modular recruiting and world-class applicant tracking solutions that add incredible value to innovative companies and help them move quickly. Our powerful recruiting API allows you to offer Hiring Happiness™ to anyone, anywhere. For more information, call 888.769.2023, email info@hiringhappiness.com, or visit atsanywhere.io.